Size of this preview: 800 × 419 pixels. Other resolutions: 320 × 168 pixels | 640 × 335 pixels | 1,024 × 537 pixels | 1,280 × 671 pixels | 2,290 × 1,200 pixels. 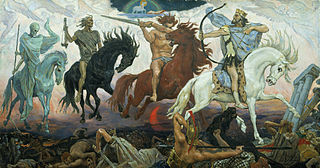 English: Four Horsemen of Apocalypse, by Viktor Vasnetsov. Painted in 1887. Українська: Віктор Васнецов, «Чотири вершники Апокаліпсиса», 1887 рік. The author died in 1926, so this work is in the public domain in its country of origin and other countries and areas where the copyright term is the author's life plus 80 years or less.